The Faculty of Information Technology of the Czech Technical University will host the Sunday workshops. The venue is easily reachable from the city center by subway, it is a short walking distance from the stop Dejvicka of the green line (line A, direction Nemocnice Motol or just Nadrazi Veleslavin or Dejvicka). From the Marriott, it takes about 25 minutes (walking + line A) or 15 minutes drive (depending on the traffic). 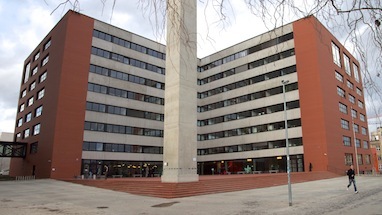 The entrance to the building is at the concave corner (behind the pillar in the direction in which the photo was taken). PDF version of 1st floor plan. PDF version of 3rd floor plan.